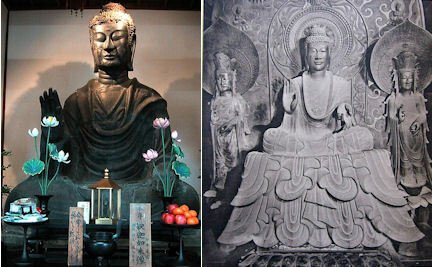 In 6th century, Buddhism was introduced to Japan from Baekje (Korea). And the same time, Buddhism statue method was also brought. At that time, craftsm an who was from overseas (especially from China and Korea) took an important role(*1). It was the period that Japanese craftsmen learned the method as assisting them. In Nara period (8th century), the Governmental Buddhism statue studios were established. So, statues were produced by many Japanese craftsmen in Heian period (8th ? 12th century). But it was not in the habit of signing craftsman’s autograph to statue at that time. And we can’t know how they kept their existences. Because there are no historical sources that recorded the relationship between teacher and student and a parent‐child relationship. In the mid of Heian period, Kojo appeared. He was son of the lower class Samurai, and he became Buddhism statue craftsman. Generally, Kojo is the father of Buddhism statue craftsman(*2). He established the first private studio (the place is unknown). The studio has produced many great craftsmen such as Jocho. *2…there is also opinion that Jocho is the father. (Left) Shaka Nyorai (Gautama Siddhartha) at Asuka-dera temple in Nara. Original is a part of face and some fingers. The face doesn’t look forward because it’s not good restoration. The hallmark of its statue is the eyes called almond-shape. (Right) Skaka Sanzon-zo at Horyu-ji temple (the oldest wooden buildings).